The family wanted a break from Dad so they could relax for half a day without me pestering them what to do next on vacation. So I planned to go off hiking for half a day and then do some snorkeling with them later. The sun was rising over Kaneohe as I headed south on SR83, aiming for Interstate H3 and the tunnel through the Ko'olau Range. I was heading west to do a hike on the drier west side of the island with a 60% chance of rain forecasted over the Ko'olau Summit. But I noticed the clouds had lifted from the crest and it looked to be unusually clear. So I quickly changed destinations to head for the Ka'au Crater Trail that goes to the summit of Palikea on the Ko'olau crest. The trail is non-official but quite popular, the trailhead located at the end of Waiomao Rd in the Palolo neighborhood of Honolulu. The parking is somewhat limited as there are numerous homes around it and none of them are too keen to provide additional parking. A makeshift sign at the TH let's you know it's unmaintained and a Use at Your Own Risk proposition. This sign is surrounded by others that declare No Trespassing and Government Property in a confusing example of Don't Ask Don't Tell. 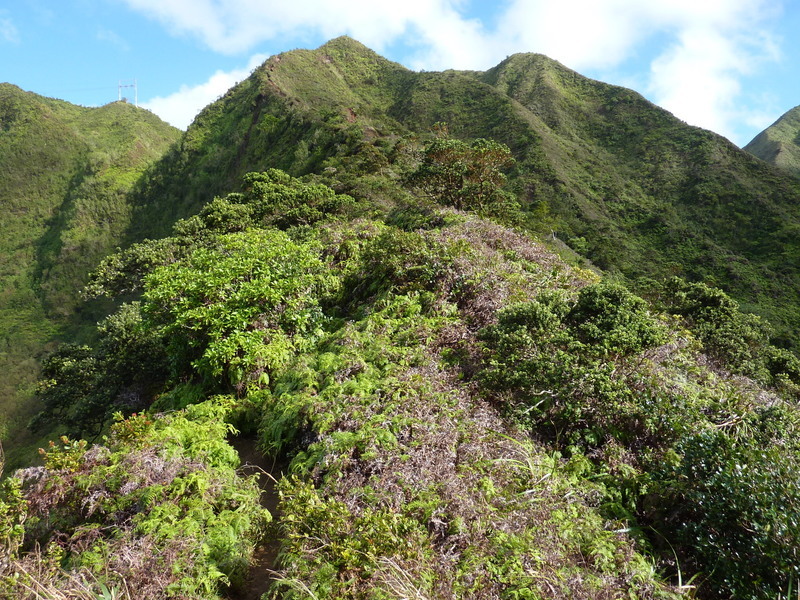 There are numerous reports you can find online describing this hike that follows the Waiomao Stream for about a mile and half to the base of three waterfalls, then up the waterfalls on one side or another before reaching the outlet to Ka'au Crater. From there one can climb the ridgeline to Palikea in another 1/3mi, for a total of just over 2mi, one-way. The more adventurous can follow a use trail around the crater's rim, a longer and somewhat more arduous effort, or so I'm led to believe. I only planned to reach Palikea and head back down so that I could keep my outing to a minimum and get back to family time - after all, they can't go that long without activity planner Dad to keep them busy. The trail starts off going downhill to meet the stream, crossing it a few times before picking up a water pipeline that is followed all the way to the falls. There are actually at least three pipelines, an old, rusting iron one, a smaller PVC one, and a newer, large iron/steel one that may or may not still carry water. In any event, one follows the very muddy (at least today) trail along the pipeline with several stream crossings (all easy on rock hops in normal stream flow) before reaching its end. There is one rope handline installed on the stream section. One group of five on the trail today used it to descend down to the stream and wallow about there a short while before I found them and redirected them back up to where they needed to be. The trick - use the rope to go up, not down. Once at the waterfalls things get more fun. The trail is not nearly as muddy going up and there's some fun scrambling to be had. There are numerous handlines to help on the more difficult and exposed sections. There are several places where one moves from one side of the falls to the other, none of them difficult (again, in normal water flow). At the top of the second falls is a small memorial plaque embedded in the backside of a large boulder that one has to go over to continue on the trail. At the base of the third falls I didn't notice the black rope dangling down to the left of the stream and went off on a short tangent when I found other ropes leading up a face across from the falls. I believe that route to be an older trail going up the waterfalls, but as I only followed it for few minutes I can't really be sure. I learned enough to see it wasn't heading to Palikea, so I returned to the base of the third falls and found the correct way up via the ropes on the left side. Halfway up it crosses to the right side, aided by an aerial handline that isn't really needed in most circumstances, but feels reassuring. As I neared the oulet to the crater above the top of the third falls I began to notice sunlight filtering down through the forest, a strange sight. On my previous visits to the Ko'olau Summit I'd always encountered increasing clouds the nearer I got to it. This time I would actually have views - what a nice surprise. I followed the continuing trail as it left the stream and started up the ridgeline to Palikea. The trail sections along the ridge are heavily eroded, sometimes horribly so. More handlines help in these sections and in a few places they seemed a necessity whatever the weather. I was thrilled to find such good views looking back to Honolulu, down to the Ka'au Crater below me, and once I reached the summit, nice views looking to the windward side and up and down the crest of the range. Bob this was the first time of your Hawaii trip that you mentioned mosquitoes..are they common throughout? Any other ticks or poison plants? Not terribly common and really only on the rainy sides of the islands. Even there, they don't bother me much because I wear long pants and shirts. Wife and daughter took some hits (up to a dozen) on short hikes with me because they exposed more skin. No ticks and no poisonous plants (to the touch, anyway).